Zion National Park is located in southern Utah and is situated in the heart of red rock country. Like nearby Bryce National Park, Zion is a geologic wonderland. The picturesque park is made up of a convergence of three geographic zones: the Great Basin, the Mojave Desert, and the Colorado Plateau. However, unlike Bryce’s amphitheaters and hoodoos, Zion is a narrow 229 square mile park whose main feature is Zion Canyon which is a half-mile deep scar in the earth cut by the Virgin River. Due to the nature of the rock, the river has cut some extraordinary features to form the Canyon and therefore the habitats vary greatly from the top of the canyon to its floor. 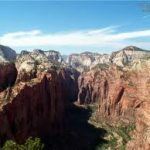 This makes Zion a gem for outdoor enthusiasts as the park is a diverse splendor in its geology and its flora and fauna. Zion is open year round, but the available activities vary from season to season. Two visitor centers help visitors find the latest information on events, tours, activities, and park conditions. The most popular time of year in Zion is spring due to the spectacular colors of the blooming wildflowers. Fall also offers some wonderful sights with the changing color of leaves. These displays make these seasons especially popular with both amateur and professional photographers. There are hiking trails of every activity level ranging from the easy and short paved walks to strenuous multi-day backpacking trips into the backcountry. There are even walks that are accessible to handicap visitors. These trails also vary in the types of terrain and features they cover. There are trails overlooking the surrounding vista from the canyon rim and there are intimate walks into canyon gardens featuring fresh springs and pristine pools. Horseback riding is another great way to see Zion. There are two routes offered. One is a short one hour ride while the other is a half day guided ride. For a more educational visit, there are plenty of ranger-led activities ranging from guided hikes to talks and lectures. There is even a shuttle tour. All ranger-led programs are free. Due to the delicate nature of Zion’s ecology, there are a limited amount of people allowed in its backcountry at any given time. So visitors should make a reservation for a backcountry permit well in advance – especially during spring and summer. For some areas, the only way to get a permit in peak season is via lottery. Also, as any experienced adventurer knows, it’s critical to plan your trip well in advance. The terrain and conditions at Zion can be unpredictable. So the park rangers have provided a backcountry desk, conveniently located in the Zion Canyon Visitor Center, to answer any questions and provide information on current conditions. Besides backpacking, outdoor enthusiasts in the backcountry can enjoy some climbing opportunities. However, the rock is sandstone and can make for tricky climbing for those with little experience. Also, because of the harshness of the desert climate during the winter, climbs are not recommended during the summer. The best seasons for climbing in Zion are spring and early fall. There are limited boating opportunities in Zion. Inner tubes are not allowed, but experienced rafters and kayakers should find the conditions quite challenging. Due to the remoteness and difficulty in traversing narrow and deep canyons, rescue is not a certainty so boaters should be experienced and prepared. This will help make the trip safe and exciting while traversing some of the most beautiful stretches of river in the world. For lodging, the Zion Lodge is open year-round and provides the only in-park lodging. Alternatively, the nearby town of Springdale offers additional lodging and RV and camping facilities. There are three campgrounds at Zion. Watchman and South campgrounds are both in Zion Canyon. Lava Point is an hour drive from Zion Canyon, near the Kolob Canyon section of the park. The campsites are popular and only Watchman accepts reservations, the others are on a first-come, first-served basis.